Ebenezer Hailemariam, Rhys Goldstein, Ramtin Attar, and Azam Khan. 2011. 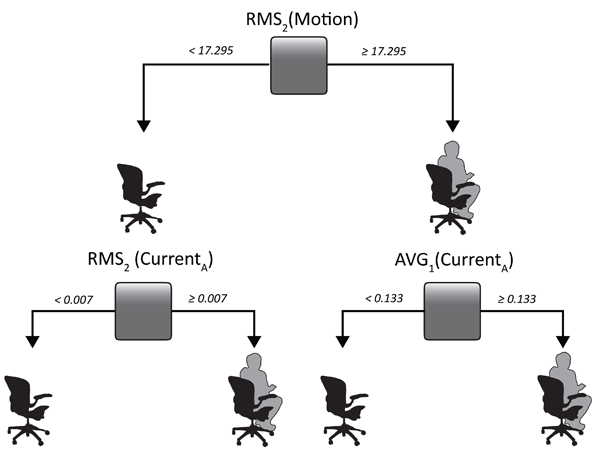 Real-time occupancy detection using decision trees with multiple sensor types. In Proceedings of the 2011 Symposium on Simulation for Architecture and Urban Design (SimAUD '11). Society for Computer Simulation International, San Diego, CA, USA, 141-148. The ability to accurately determine localized building occupancy in real time enables several compelling applications, including intelligent control of building systems to minimize energy use and real-time building visualization. Having equipped an office workspace with a heterogeneous sensor array, our goal was to use the sensors in tandem to produce a real-time occupancy detector. We used Decision Trees to perform the classification and to explore the relationship between different types of sensors, features derived from sensor data, and occupancy. We found that the individual feature which best distinguished presence from absence was the root mean square error of a passive infrared motion sensor, calculated over a two-minute period. When used with a simple threshold, this individual feature detected occupancy with 97.9% accuracy. Combining multiple motion sensor features with a decision tree, the accuracy improved to 98.4%. Counter-intuitively, the addition of other types of sensors, such as sound, CO2, and power use, worsened the classification results. The implication is that, while Decision Trees may improve occupancy detection systems based on motion sensors alone, one risks over-fitting if multiple types of sensors are combined.